Harlem Village Academics is a network of charter schools in Harlem, New York. Founded by Deborah Kenny, HVA strives to provide education that helps students become independent thinkers and compassionate individuals who make meaningful contributions to society. 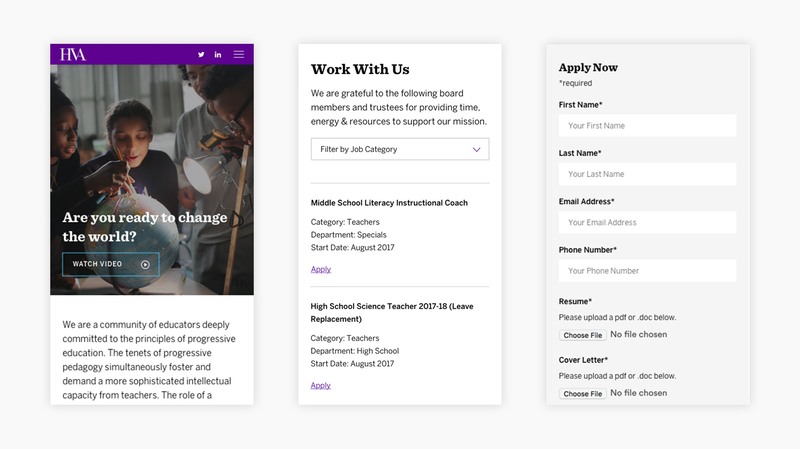 We worked with HVA to redesign and develop their website, which plays an important role in the recruitment of new teachers. The website, built on WordPress, features flexible templates that allow the HVA team to create unique, content-rich pages. We were fortunate to work with John Korpics, the Chief of Marketing at HVA, whose web savvy and creative skills (the website’s photos were all taken by him) pushed our team to create UX and technical solutions that led to a visually impactful website with performance and usability top of mind. The result is a robust platform that’s designed to be a central communications and marketing tool for years to come.